As described on the Configuring a leaderboard page, you can set any points type, achievement type or rank type as metrics to track. For achievement types, the metric tracked is the number of achievements earned of this type. For points types, the metric tracked is the current balance of points of this type. For rank types, the metric tracked is the priority value of current rank of this type earned. 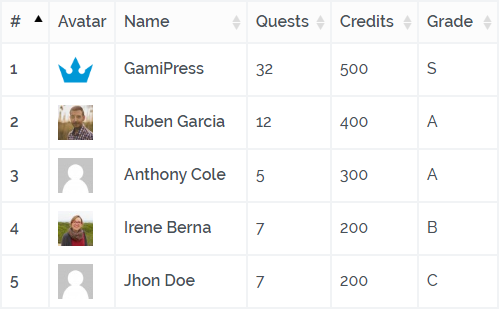 On this leaderboard users are ranked by the number of Quests (achievement type) they earned, their current Credits (points type) balance and their current Grade (rank type) priority. The rank priority could be decisive to determine the user position, look at lowest positions where 2 users has got the same number of achievements and points but one of them got a higher rank. In the above example you saw how the rank priority can affect to users positions, but you can make a rank be more decisive with the priority field.